This important work is a must-read for church leaders. 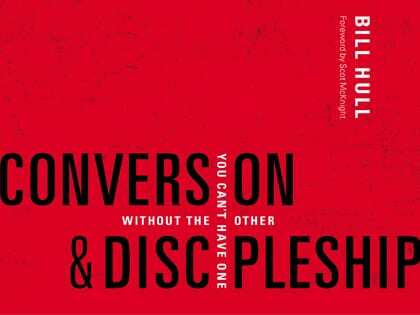 Bill Hull wisely demonstrates how our beliefs about the gospel, salvation and the church dramatically alter how we make disciples. Hull also winsomely gives a helpful account of what brought us to our contemporary discipleship issues. While he provides insight into the issues, he doesn’t settle for pragmatic solutions but dives deep into our theology and thinking. Furthermore, he offers a path forward and welcomes you into a much-needed conversation on a robust picture of the gospel and the task of following Jesus. This book tears down the walls between many discipleship methods and points toward a beautiful picture in which we holistically make disciples in large groups, missional communities and deep, intimate friendship. Preston Sprinkle takes the robust findings of the “State of Discipleship Report” from the Barna Group and challenges us not only to look at the statistics but to look to Jesus and model our path forward after him. EVALUATED BY BRAD WATSON, executive director of Gospel-Centered Discipleship and pastor of coaching and missions at Bread&Wine Communities in Portland, Oregon.